The dollhouse has seen many improvements since I last blogged. Mostly, I have concentrated my efforts in the large servant's kitchen. decided to build a copy of my wall baker's rack that I bought at the Martha Stewart auction. but I no longer have time to take out a fancy camera as I am working hard on the dollhouse. and that meant I would build it to be 3 inches by 3 inches. Next I sprayed the entire thing in a box (my spray booth). 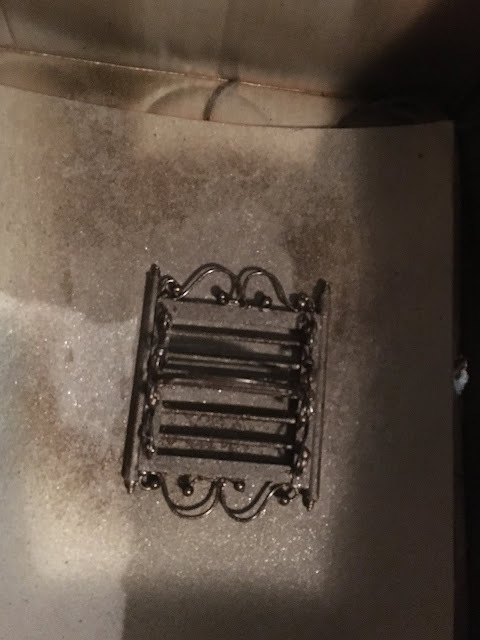 After it dried I held it up to compare to the real thing in my kitchen. Wow! Not bad for a few hours of effort. and add a central feature like the shaft of wheat that my big rack has. It turned out quite charming and I just stuck it on the wall over the range to see how it looked. to another wall. More copper is on the way, so I can fill out the kitchen to mimic my own. Brick floors were to go in, as well as aging the walls, after all this is servants quarters. dining room got wallpaper and its chandelier electrified!! The other side of the kitchen has the cabinetry I made that just got installed! I will follow this post up with those two improvements and more. I am so pleased to see such a HUGE response! in your local book store or on Nora's website. Shirley's blog at Housepitality Designs. The winner of the book is Jane Pickett from Worcester, Mass! and photographer made their way to my house to shoot it for her book. complimentary copy of Nora's book, directly from Nora herself! with your email address so I can get in touch with you for your mailing address. One lucky winner will be chosen Sunday night! copy of her book for the giveaway. and its really quite clever. my purple transfer ware collection. 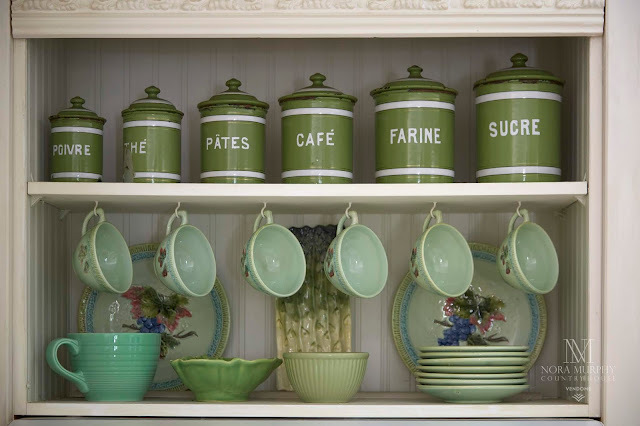 And this snippet of my kitchen is just a hint of things you will see in the book. Nora's book, its worth getting the book just for kitchen inspiration!! can leave me a comment telling me why you would like one. I will pick one winner Sunday night!! at amymaisondecor@gmail.com and you can enter that way. that is because I get spam, so your comment will appear. 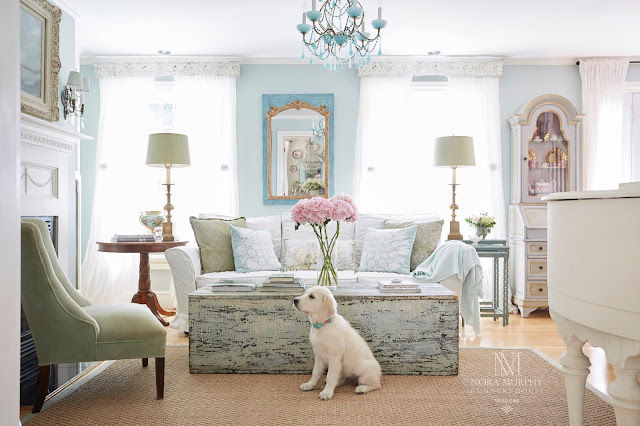 antique and farmhouse, there is someone recreating a miniature world in every decor style. 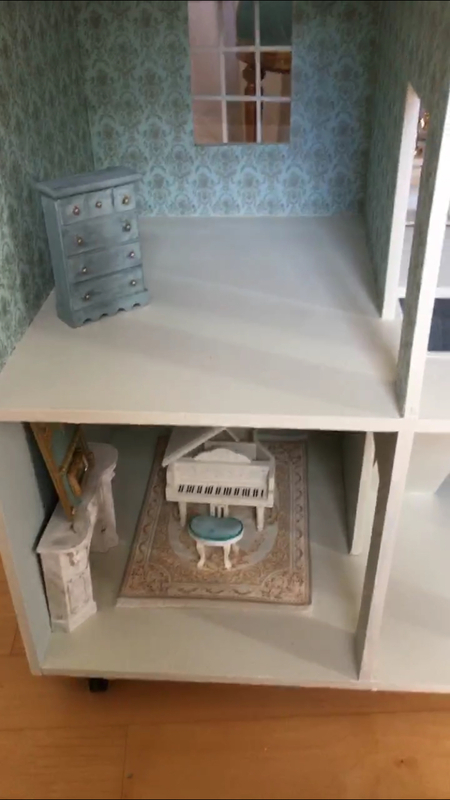 My own dollhouse is going to be a fusion of styles, much like how I decorate my own home. then sprinkled with the vintage faded grandeur look I find so attractive. This bathroom started with a kit of a tub, pedestal sink and a toilet at a reasonable price. customize ready to buy pieces that are unfinished wood or stay in a lower price bracket. and turned it into the shabby chic cottage dressing table in my bathroom. curtain making decorating days as a designer. The rest is pretty much unfinished, as the moldings and the electrical and wall finishes need to be added. So remember, this is a progress report! Natural Elements (#1515), the same color I have in my real life dining room. a painted backdrop instead of unfinished wood. in the center and the potting room that leads to the roof deck on the right. big country kitchen ( cut off from view). by someone from scratch, not a dollhouse kit, which I think has better floor plans). to be the best place in this layout. I snapped this pic for Instagram, showing hubs at work cutting the walls. so he switched his tool choice to a coping saw (shaped like a giant U). This house is already a Fixer Upper lol. But look how much nicer it will be!! The dining room will have a pair of columns along the new openings. Oh yes, I have such grand ideas don't I?? at a craft store, but I don't really care for the effect. I will have to do real wood floors. 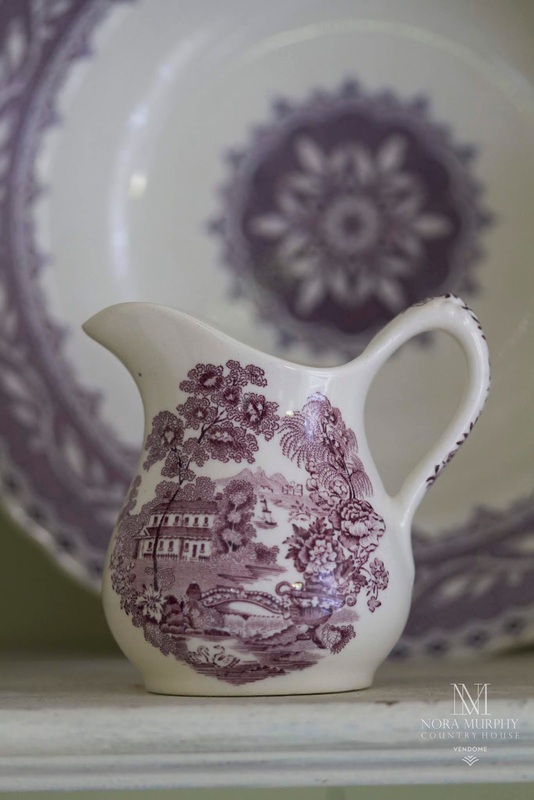 purple transferware in the cupboard and on the table! I almost died when I found a set of 52 pieces of purple transferware in 1/12 scale. You can also see I started to build a railing on the staircase and have since added the banister. I used instant wood glue and I almost glued my fingertips together. This tiny glueing is not easy. Last but not least, my grand piano. This was the first group of miniature items I bought for my dollhouse. 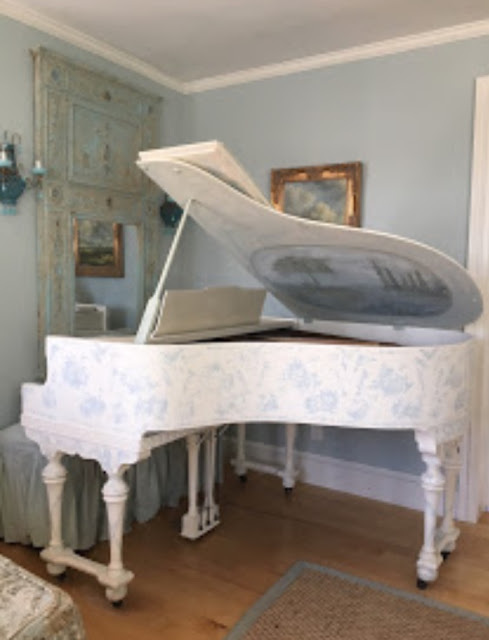 customize it to match the piano I had painted for my own home. I painted it in Old White chalk paint first. detail I needed to copy my own real life piano. lid of the piano. It really looks adorable doesn't it? and will be back soon to show off my next installment of progress. Like wallpapering and finding an Aubusson rug....haha!! I told you, this is so much fun!